Is MSU the School For Me? 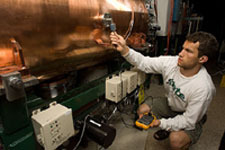 At MSU, you can choose an area of research ranging from acoustics to quantum computing. With the plethora of choices, many incoming graduate students aren't sure what area of physics they want to study. For this purpose we offer the PHY 800 course: a chance for you to do research with a group for course credit with no obligations. You might find the 800 course as a great way to spend the summer between undergrad and graduate school. The only comprehensive exam you will take at MSU is the placement-qualification exam taken during orientation week. The finals for the 4 core courses serve as subject exams. There is no formal oral exam. However, there are plenty of opportunities for you to give a seminar talk and the questions that follow can sometimes feel like an examination. For more information on exams see the Graduate Handbook (pdf). At MSU it is possible, and often encouraged, to take classes in other departments. Math, chemistry, engineering, computer programming and even foreign languages are examples of subjects that can enhance your education. You might also find it useful to take an upper level undergraduate course as a refresher or to fill in gaps in your undergraduate education. The Grand Canonical Ensemble is a small a cappella choir comprised mainly of graduate students and faculty of the physics department and friends thereof. The ensemble is open to singers of all levels of ability and no formal auditions take place. Their repertoire is ergodic in genre space, exploring music from renaissance to pop. A subset of the GCE is Choir++, an elite ensemble which tackles more difficult music. The BPS Bldg. (where most physics classes are held) is near the buildings which house the chemistry, engineering, and math departments. The NSCL (a premiere lab for rare isotope research) is a courtyard away from the BPS. Both the campus bus terminal and a parking garage are across the street from BPS and NSCL. The graduate dorm, Owen Hall, is only a block away from the BPS Bldg. Although some may debate the length of Spring in East Lansing, you will experience all seasons in East Lansing. The temperature ranges from 5-90 degrees Fahrenheit throughout the year. The summers in East Lansing are gorgeous. Moving to a new city sometimes presents the problem of finding a new local bank. There are many banks to choose from but MSU Federal Credit Union makes this choice easy with ATMs located all over campus, including one in the BPS Bldg., and throughout the Lansing area. Direct deposit of your stipend as well as automatic deductions for campus housing are straightforward to set up.